For some patients, Dental Restorative Group may recommend crown lengthening in advance of filling a cavity or mounting a prosthetic crown. The procedure revises the site of the existing crown to make it more accessible for a filling or to create a sturdier, more effective base for the new crown. Dental Restorative Group offers three locations for crown lengthening patients, including Belmont, Cambridge, and Arlington. As a result, receiving treatment is convenient, and our doctors can provide you with a broad array of resources, including an in-office dental laboratory and technician. This means our team can conduct the work of crown fabrication on premises, speeding up and customizing the process and providing a single practice for your care. Learn more. Crown lengthening is a common procedure that Dental Restorative Group provides to expose more of a tooth. Typically, our doctors recommend the procedure when the existing crown is not visible enough to place a prosthetic crown or to perform a dental filling. A tooth is broken above the gum line. 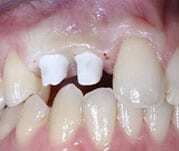 A cavity is below the gum line. The previous crown or filling fell off of the tooth and the remaining surface isn’t appropriate for mounting a replacement. When you receive a crown, you want it to look natural and aesthetically pleasing: a seamless addition to a beautiful smile. You also want the crown to last a long time. Crown lengthening may be necessary for your doctor to accomplish these goals. When a tooth is shorter or smaller, there is less surface area for the crown to adhere to the tooth. 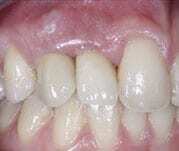 Uneven or decayed teeth present similar challenges. Dental Restorative Group recommends crown lengthening to create a more accessible mounting that will fit your new crown better. The closer the fit between the existing tooth and the crown, the stronger the bond they can form. This results in a more durable outcome. Come to Dental Restorative Group for an initial consultation in Belmont, Cambridge, or Arlington. Your doctor will review your medical history, take X-rays or review your existing X-rays, and identify the right approach to your crown lengthening procedure. Our professionals spend a lot of time with patients to ensure that those in their care understand treatment and that they have the information they need. We encourage you to ask questions at any point in the process. You will receive a local anesthetic to desensitize the area so that you will be more comfortable during treatment. Our doctors, who specialize in advanced procedures, may use a CO2 laser or other dental tools to perform the crown lengthening. Lasers have the advantage of being minimally invasive and allowing for faster recovery. Most Belmont, Cambridge, and Arlington patients describe the treatment as a warming sensation that is very manageable. Procedures generally take five-to-ten minutes. Most of our patients use over-the-counter medication to manage pain after the local anesthetic wears off. Your procedure may differ from another patient’s—the number of sites treated; whether tissue, bone, or both were both revised; and the depth of the procedure—and so your recovery experience will differ as well. Expect that it will take about four weeks after your crown lengthening for the site to heal. Dental Restorative Group will provide you with full guidelines for post-operative care. This may include adjusting your diet and brushing habits for a period of time while the site heals. Once your doctor has reviewed your progress in a follow-up visit, you will be ready to have your crown placed or cavity filled. Dental Restorative Group offers comprehensive examinations to help determine whether you could benefit from a crown lengthening procedure. Schedule an appointment in Belmont or at any of our office locations.